Dumb and Dumber or just plain Smart? You know it’s been a slow news day when “smart” meters dominate the headlines on a Saturday! Strangely this was the case this past weekend following the release of a report from a parliamentary group. The headlines were driven by numbers, which are highly debatable and will absolutely be determined by how individual households use their energy. The news bulletins didn’t really seem to cover that point though. So, in short we probably didn’t learn anything other than the news on Saturday wasn’t that exciting! However, I’ll park my cynicism for a moment and try to cut through the misinformation and explain why we should embrace the concept of smart meters. Firstly we need to rewind to 2007, in the August of that year the Government held a consultation that formed the genesis of where we are with “smart” in 2018. At that time a positive business case to the tune of many billions of pounds was written and the concept of our energy meters becoming “smart” to save money was born. Then unlike most other countries that have rolled out smart meters, we chose not to do it via the local distribution networks, but instead, place the burden on the energy suppliers. Its important at this point to remember that today this number stands around 70 separate energy retailers. Naturally these suppliers don’t have money to give away, so this cost (new meters, installation and data infrastructure) is in-effect being passed on to end users such as you and I. Already seems complicated doesn’t it? In short yes. So, a body – Smart Energy GB (https://www.smartenergygb.org/en) was created to tell us all about this huge project and the wonderful benefits we would see as consumers. Again the funding for this body was firmly put at the door of the energy suppliers, so yes, you’ve got it, again its paid for via our bills. When you hear energy suppliers calling out “regulatory” costs for our bills going up, this is in part what they’re referring to. 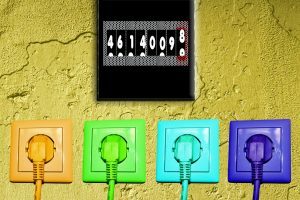 Knowing more about how, why and when we consume energy is important and therefore the concept of moving from “dumb” meters to a new smart world is a laudable one. Particularly when the realities of distributed energy and vehicle electrification take hold. However, we all need to remember that what we pay for energy is derived from the amount we consume multiplied by the price. So, no matter your meter type or the technology your employing, the best way to save is of course to consume less energy and at the same time ensure the price your paying is the lowest it can be. Copyright © 2017 Switching Energy All Rights Reserved.